Lasers are now the main method of treatment for a multitude of skin conditions because it is safe, comfortable and effective. It allows physicians to treat skin conditions with precision and without injuring normal skin as individual lasers target specific tissues in a highly selective way (e.g. Pigment lasers target melanin in the abnormal cells, or vascular lasers target haemoglobin). The majority of laser treatments are fast, taking 5 to 10 minutes and require only topical surface anaesthesia, or no anaesthesia at all. This makes them perfect for quick lunch-time procedures. Laser Skin Treatments can be used as stand-alone procedures or can be used to complement other medical treatments. They can be an effective alternative to drug or medication based treatments, minimising unpleasant side effects. What is the science behind lasers, why are they special and how do laser skin treatments work? LASER is an acronym for 'Light Amplification by Stimulated Emission of Radiation'. Laser devices essentially produce a highly focused, intense beam of (coherent monochromatic) light energy in a pure single wavelength. This beam of light is then able to penetrate the surface of the skin and precisely target specific light-absorbing chemicals within the skin, that absorb light of that specific wavelength (Chromophores). This precision minimises injury to normal skin structures. This concept of Selective photothermolysis has revolutionised the therapeutic role of lasers in medicine and has been applied successfully to the treatment of unwanted vascular malformations, pigment related conditions, tattoo removal, wrinkles, skin rejuvenation and hair removal. Lasers can now also be used for the non-invasive removal of unwanted fat. What conditions are commonly treated with lasers? Removal of skin blemishes, bumps, skin tags, moles and warts. 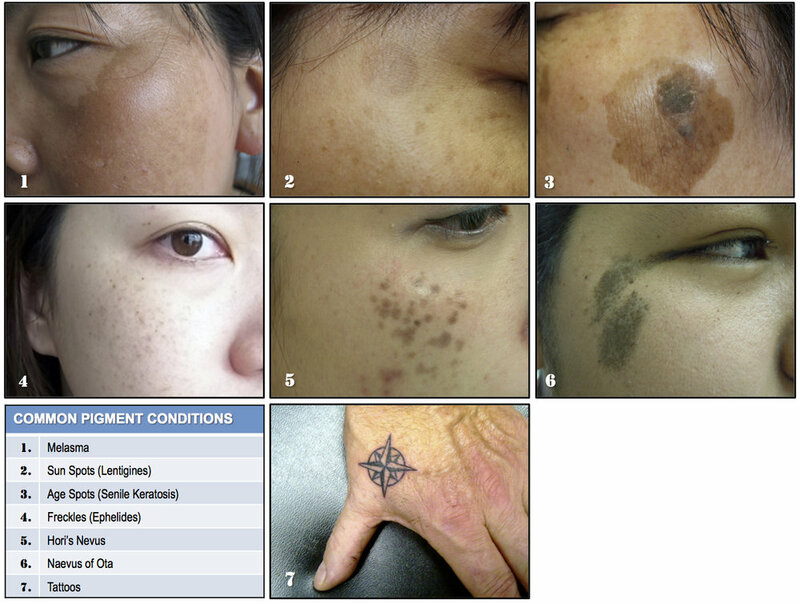 Nd-YAG Q-sw Pigment Lasers for Dermal Pigmented Lesions. These pigment Laser skin treatments are used to treat dermal pigments utilising a photo-acoustic effect to effectively lighten and remove deeper dermal pigmentation such as Hori's naevus, Naevus of Ota, Tattoos and other stubborn spots. 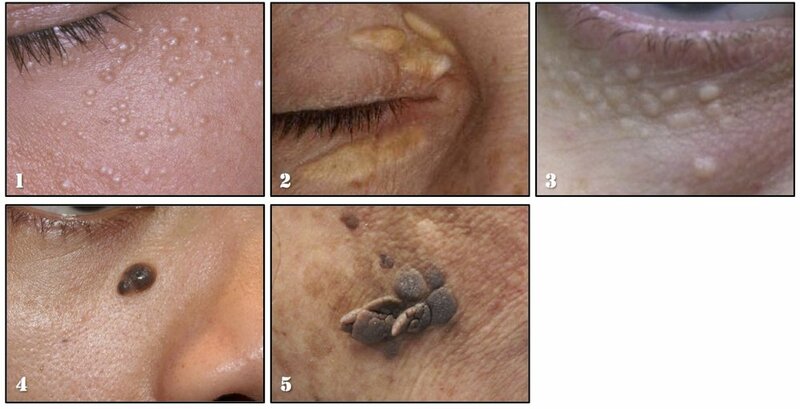 This gentle non-ablative (doesn’t break the skin) laser skin treatment that has minimal discomfort and downtime, Spectra Laser Toning is a new and advanced treatment for melasma that penetrates and targets the melanin in the deep dermis part of the skin and disperses dermal and epidermal melasma pigmentation, without excessive skin irritation. It safely lightens and evens the skin tone, while smoothening skin texture at the same time. Read more about Spectra. The Intense Pulse Light PhotoFacial™ BBL (Sciton Broadband Light) treatments are a series of gentle full face, pulsed light treatments for skin rejuvenation. It improves the appearance of sun damaged and aged skin, reduces face and neck redness and flushing, broken capillaries, brown sun spots, improves fine wrinkles and shrinks large pores. PhotoFacial™ BBL treatments result in more youthful-looking skin. This is a lunchtime, on-the-go treatment for busy individuals, and has no downtime. CO2 Laser Skin Resurfacing uses energy to vaporise aged or damaged skin while stimulating new collagen growth in the surrounding tissue.The Fractional CO2 Resurfacing laser is a recent breakthrough in laser skin treatment that offers patients the positive results of ablative resurfacing with faster recovery times normally associated with non-ablative therapies. Unlike earlier ablative laser resurfacing techniques that remove the entire surface layers of skin, the Fractional Laser Resurfacing procedure produces tiny, microscopic columns of thermal impact separated by areas of unaffected, healthy tissue. This spared healthy tissue between treatment zones are a reservoir of viable cells that promote rapid healing regeneration of the skin. As only fractional volumes of the target tissue are impacted, the risks of long recovery times and severe side effects are dramatically reduced. The Fractional CO2 Resurfacing laser is an innovation in the treatment of aging and sun-damaged skin, and an exceptionally effective laser for the treatment of stubborn problems such as acne scars and deep pigmentation that are not successfully treated by traditional methods. It delivers an overall skin rejuvenation and refreshes the skin so new skin looks younger, softer and smoother. Unattractive or uncomfortable moles, skin tags, milia, syringomas and other skin blemishes can be removed with a simple procedure that can be carried out efficiently and safely under local anaesthesia, with minimal risk of scarring and little downtime. The CO2 laser uses very short pulsed light energy (known as ultra pulse) to remove thin layers of skin with precision and minimal heat damage to surrounding skin, resulting in rapid recovery times. Do you wish you had smaller pores, fewer blackheads, a fairer smoother complexion and a healthy even glow? This is a Q-switched Nd:Yag laser skin treatment for rejuvenation. A carbon lotion is applied prior to treatment to focus the laser energy within the pores and hair follicles. Resulting in a photo-acoustic effect that rejuvenates the skin by (1) Gentle photoablation of the outermost epidermis and (2) gentle bio-stimulation of the collagen regeneration and dermal skin cells. This improves skin texture/tone, pore size and pigmentation with no or minimal downtime. Light-based and Laser Skin Treatments can lead to rapid improvement of Active Acne lesions by: (1) exfoliating surface skin to unplug pores, (2) reducing sebaceous gland activity, (3) reducing acne-causing bacteria numbers. This is a carbon-assisted laser skin treatment that utilises a photo-thermal effect and photo-chemical superficial peeling to control acne inflammation, reduce sebum production, unplug pores and minimise pore size. The Spectra Peel will also improve the appearance of acne scars, uneven pigmentation and poor skin texture. Dead skin, sebum, skin oils and colonising bacteria (Proprionibacterium acnes) clog pore openings (blackheads and whiteheads) and enlarged pore size all contribute to acne. This safe and non-invasive skin rejuvenation procedure is highly effective in controlling oily skin and sebaceous activity; unclogs and minimises pores to reduce breakouts and improve appearance. More information about Spectra Laser Peel. SCITON Broadband blue-Light (BBL™) for Acne. Sciton Broadband Light (BBL™) is a FDA approved treatment that has now proven to be helpful in the treatment of acne. Utilising a filter for the shorter wavelengths of BBL™ in the blue-light spectrum, the procedure selectively attacks the Proprionibacterium Acnes bacteria on the surface and in the sebaceous glands that contribute to acne. This is an excellent alternative to oral medications such as Accutane or long-term antibiotics, especially for patients who are sensitive to or cannot take oral medications. More information about Sciton Broadband Light. The Fractional CO2 laser skin treatment is among the safest and most effective treatment for the majority of patients with acne scars. By resurfacing the skin in “fractions” at a time, the surrounding skin areas are left intact for faster healing. The fractional CO2 laser creates tiny microscopic holes in the skin down past the epidermis and into the dermis. These holes cause new collagen to be generated, which fills in the acne scars and creates rejuvenated softer smoother skin. The MicroLaserPeel, or Nano Peel, is a skin-resurfacing procedure that targets the mid-epidermal layer of the skin using Sciton’s Erbium laser. Micro Laser Peels help to reduce wrinkles, brighten the skin and smooth the texture and tone so that makeup application is rendered easier. It is a more technologically advanced version of microdermabrasion: rather than simply removing a limited layer of skin, it additionally boosts collagen and elastin production. This laser skin treatment is a superior preferred rejuvenating procedure for the busy professional "on the go", providing effectiveness, comfort, safety and reduced downtimes for the treatment of acne scars and wrinkles. These Laser skin treatments for resurfacing can be combined with other treatments such as TCA CROSS, subcision and/or Dermal fillers to improve results and treat skins with a combination of scar types. A full spectrum of Laser and Light based treatments are available at our Laser Centre, The Aesthetic Studio Clinic & Surgery. To discuss how Laser Skin Treatments can best help you, and to have an effective treatment plan designed and specifically tailored to your needs, make an appointment with our experienced aesthetic doctor.